This 3D rendering project was created for a private residence located in Cliffside Park. The client purchased a new home and renovated the entire space. Using Jessica Benari Designs rendering services they wanted to see the new kitchen rendered with cabinetry and appliances selected. The house was site measured and floor plans were created by Jessica Benari Designs. Working closely with the kitchen design studio a design concept was conceived and renderings were created for the new space. The renderings below illustrate how easy it is to change colors in the rendering to make decision decisions prior to ordering materials. Which one do you like?! 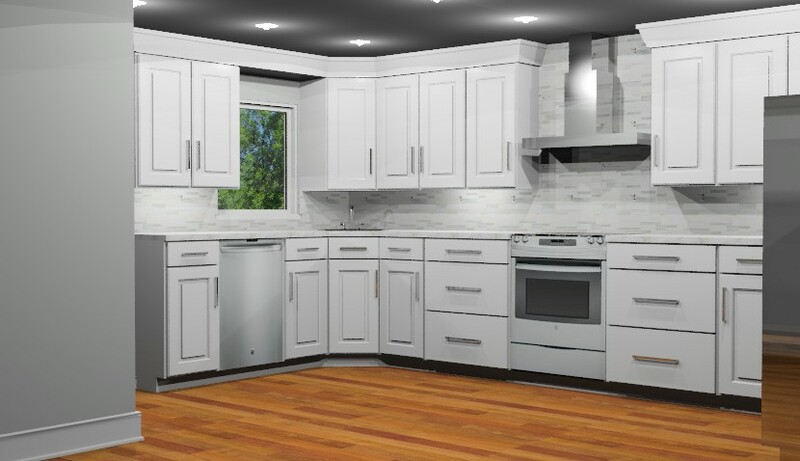 3D Computer Rendering of new kitchen space illustrating white cabinetry. 3D Computer Rendering of new kitchen space illustrating carmel colored cabinetry.